Cat vs Pill. There are no winners. Most people would rather watch 12 hours of Parliament Time on the ABC, back to back, than attempt to give a cat a pill. It’s just as exasperating but there’s less chance of bloodshed. Usually. A quick scour of the internet will produce blogs and countless You Tube video clips offering a solution to the cat/pill conundrum. All of them are complicated and none guarantee you’ll escape without eye-watering injury. Just like some pollies, when cornered, even the mildest of mannered moggies can put up the meanest of fights! However help now comes from an unexpected quarter. 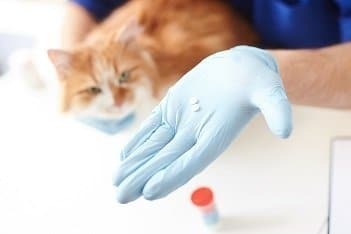 Compounding chemists can make up your cat’s medication, precisely as it comes from the packet, but in a flavour, such as tuna, that your feline friend will love. A compounding chemist may also, in some circumstances, be able to make up your medication in liquid form, which may be easier to administer through an oral syringe. National Compounding Chemist can help you with this however we will need a prescription, so if your nerves are stretched to the limit by kitty’s pill-time conniptions, talk to your vet about how individually prepared compounded medication can help. If your vet is unable to help, give us a call or drop us a line and we’ll be able to put you in touch with an experienced and reputable vet that can.